The Printed and the Built. Architecture and Public Debate in Modern Europe is a multidisciplinary research project situated at the Oslo School of Architecture and Design / the Oslo Centre for Critical Architectural Studies (OCCAS), in collaboration with the University of Oslo, the National Museum for Art, Design and Architecture, and a wide international network. 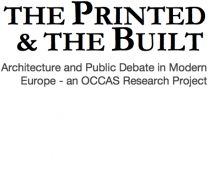 The project studies the relationship between the built environment and print culture in 19th and early 20th century Europe. In this period, a host of new public media developed, altering the way architecture was discussed, understood, and – ultimately – built. Looking particularly at the illustrated press emerging in early to mid 19th century, the project examines the way architecture in the modern period becomes a site for cultural negotiation through printed media. This multidisciplinary humanities study will, we believe, throw new light on the intricate web of spatial, material and discursive practices that shaped the modern public sphere. The project is financed by the Norwegian Research Council’s FRIPRO-program for a period of three years, starting September 2014. Led by Mari Hvattum, it involves OCCAS scholars Mari Lending, Victor Plahte Tschudi, Tim Anstey and Léa-Catherine Szacka, Helge Jordheim from the University of Oslo, two PhD candidates; Sine Halkjelsvik Bjordal (UiO) and Iver Tangen Stensrud (AHO), as well as a postdoc, Anne Hultzsch. Two AHO PhDs, Mathilde Dahl and Mathilde Sprovin, are affiliated with the project, and AHO master students participate through the annual Printed & Built studio. The Printed and Built project collaborates with a wide international network in Europe and the United States. Richard Wittman (University of California Santa Barbara) and Wallis Miller (University of Kentucky) are guest researchers to the project.